Cocoa Life's seedling program is expanding! One of Cocoa Life's primary goals is to improve farmers' livelihoods, and one of the ways to do this is by improving productivity. How can farmers grow more cocoa on the same amount of land? With better trees. Cocoa Life delivered 100,000 improved seedlings to farmers in Ghana in 2015, working in partnership with CocoaAction - a voluntary, industry-wide strategy aligning chocolate companies, governments, and stakeholders on key issues in cocoa sustainability. Cocoa Life has this year expanded the seedling program to Côte d'Ivoire and Indonesia and is trialling a range of interventions with one objective: improved cocoa trees. Alison Branch, Senior Associate Principal Scientist for the Cocoa Life technology platform, and Cedric van Cutsem, Global Operations Manager for Cocoa Life, answer questions about the seedling program. Pictured: Mr. Endriyanto, head of Community Nursery Management, Kakao Sinar Jaya Cooperative, Pringsewu District, Lampung, Sumatra. Why do cocoa farmers need new trees? Alison: When trees are old and diseased, they do not produce as much cocoa. A massive new planting is then needed. But before this program, farmers did not have sufficient access to seedlings, let alone access to improved seedlings. How many improved seedlings did cocoa farmers gain access to in 2016 through this program? Cedric: The distribution is currently taking place and we expect to end up with about 400,000 improved seedlings in Ghana, 200,000 in Côte d'Ivoire, and close to 300,000 in Indonesia. Why will these improved seedlings provide a better yield than the existing trees? Alison: Because of the way we grow these seedlings in the nurseries. The new seedlings will grow into more robust trees, and will reach maturity sooner. Our monitoring program allows us to measure the performance of these plants so we can ensure we adopt the most efficient processes. Cedric: These new seedlings start producing pods an average of 18 months after planting. Previously, a farmer would wait about three years after planting seeds before seeing the first pods. More importantly, these trees have been showing better survival rates all along the process, which is of course critical for farmers. How did Cocoa Life determine that investing in professional nurseries would be an efficient way to provide farmers with seedlings? Alison: The scale of professional nurseries allows us to introduce specific planting materials, better structures, automatic irrigation, and better shading solutions. Once planted on the farm, the seedlings from nurseries we have invested in are more likely to survive and become healthy trees. We're expecting a 90 percent survival rate for our seedlings. Farmers were seeing just a 50-70 percent survival rate with the planting material previously available to them. Can you explain why this program is innovative? Cedric: The planting material we're distributing is improved and yet, we believe, affordable. And our distribution systems provide farmers with easier access to the material. Another way the Cocoa Life program is innovative revolves around the monitoring process that assesses the performance of our seedlings. What else is new about the seedling program? Cedric: In Ghana, we are piloting a new way of distributing these seedlings. With our partner, we have now implemented two community distribution points. We are looking at ways to use this as a service managed by and for the communities. While setting up these improved nurseries and distribution networks, we continue to support farming to establish nurseries in their own communities because it helps to increase the overall supply of new trees. We are also testing a project to produce improved economic shade trees, starting with 1,000 trees this year. Indeed, the use of shade trees in cocoa farms is one of the recommended agricultural practices and could also generate additional income over the long term. Are farmers willing to pay extra for these seedlings? Cedric: Yes. The farmers have begun to have access to demonstration plots where they can see the difference between these seedlings vs. traditional trees, and farmers come to understand the importance of choosing the improved seedlings. We need to reach a certain number of seedlings per nursery to start seeing significant economies of scale. The benefits of this program are evident. 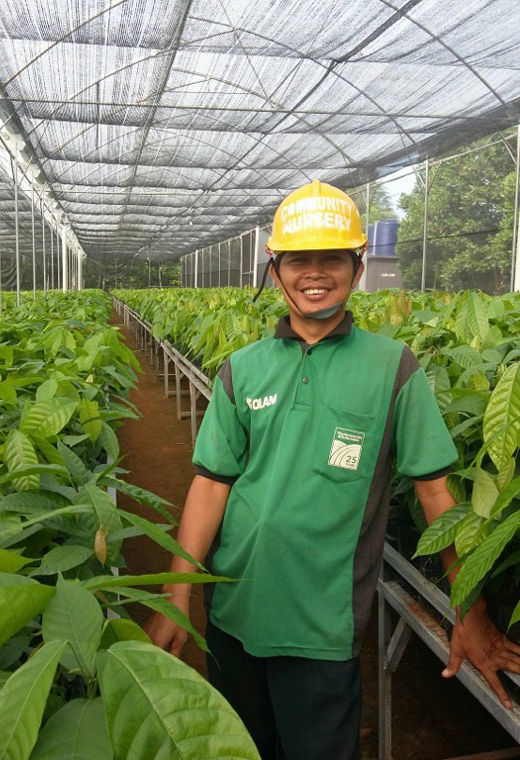 The progress of the seedling program has so far been extremely encouraging: "Cocoa Life fully supported us to form a cooperative nursery," says Mr. Endriyanto (pictured above), head of Community Nursery Management, Kakao Sinar Jaya Cooperative, Pringsewu District, Lampung, Sumatra. "The field experts help us understand what we need to do, beginning with proper planting material and high-quality seeds, good nursery management, and standard operating procedures. The community nursery brings opportunities for us to work as a professional service provider for other farmers who need grafting and pruning service in their farms, and this will result in additional income for us as farmers. We are bringing some talented young people from youth training programs for those activities, and this nursery will inspire the next generation to learn more about cocoa farming."